Does any job include so many roles as a teacher’s job? How many roles have you played in your teaching career? Can you think of any other roles? As for me, when I look back at my almost ten years of teaching practice I can say that I’ve played a considerable number of roles from the above list. I never chose in advance which role to play in the next lesson. Very often it wasn’t even my conscious choice in the lesson: I just responded to a given situation in the best (in my opinion) possible and appropriate way. Naturally, some roles I like more than others. Apparently, I play some roles better than others. And, honestly speaking, I sometimes don’t feel like playing any of these roles at all. 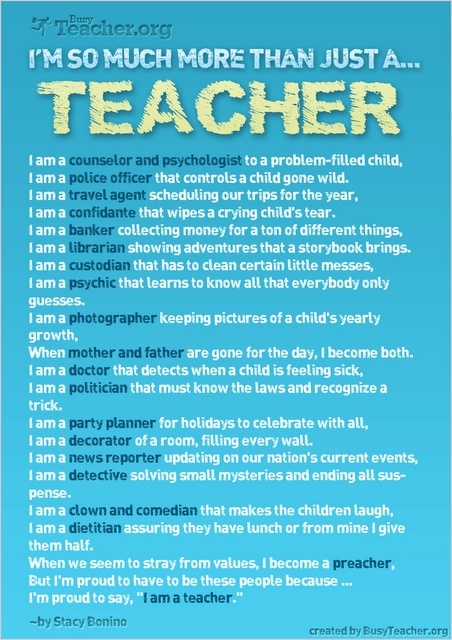 As for other roles, I can say for sure that there are much more teacher roles than those listed in the above image. At least there is one I really enjoy performing. And as you have already guessed by the title of this blogpost, this is the role of a DJ. If you know Jason R. Levine (@FluencyMC), I’m sure you will agree with me that Jason is the most brilliant example of a teacher being a DJ. He is inimitable in his ability to mix rap rhythms with English language items making English learning so fun and energetic! And here you will find a huge list (50 points!!!) on various ways music and songs can be exploited in the classroom. Surprisingly, music can be used for discipline matters! My favourite way to use music in my lessons, which actually inspired me to write this blogpost, is to use music or songs as the background while students are doing some tasks. In fact, it wasn’t my idea. I borrowed it from my teacher of English at Oxford House College in London. At first, I was surprised when she put on some music after giving us a task to work on in pairs. It was so unusual as I had never seen any teacher in my school or university use music this way. But I promptly realized how great this idea is! Secondly, music creates some noise which makes students feel less shy to speak. Otherwise, students sometimes feel embarrassed when they hear their voices echoing in the quite room. I really love looking through the music playlist on my iPhone and choosing the right music to play. Everything matters: the type of the task, the part of the lesson (the beginning, the middle, or the end), what mood I would like to put my students in, whether or not a music piece has some lyrics, and finally, the music itself (it’s rhythm, tempo, tune etc). I think that music you put on in class as the background should be light and easy and should have little lyrics. But at the same time it must be sonorous and catchy. Such music will not dominate the classroom or pull students’ attention to itself but will create a lively and pleasant atmosphere in the class.